If you want Job with Enjoying life, teaching is the best job for you. Teachers are the backbone of our society. so this is a very important job for u. After long time This year, west Bengal primary board noticed recruit primary teacher.so this is the best chance for you. 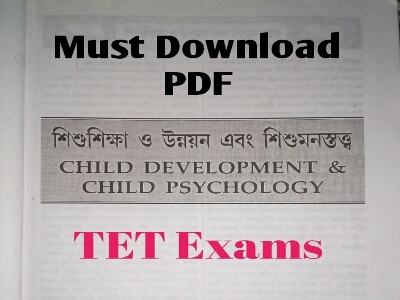 Here, GK Solve share a most important pdf book for primary teachers exams. when start a new syllbus start on primary job, Child Development & Child psychology is very daredfull and tough subject to every all students. because this is new topic for you.So GK solve share a best pdf file on child devolepment and child psychology, Which is the most important not only primary job, even also help you SSC, uper primary job.download this pdf book and practice daily. hope, you will be the success this examination.Download details below here. Next Part PDF is Next Day.Stay with us.